For lunch on weekdays, I usually walk 10minutes to the shops to get a cheap mixed rice meal. But once in awhile, when I’m feeling lazy, I’ll spend a little more on something nice at West St Cafe, which is just downstairs from my office building. They used to serve only coffee and snacks, but have recently introduced lunch as well. The menu changes everyday. 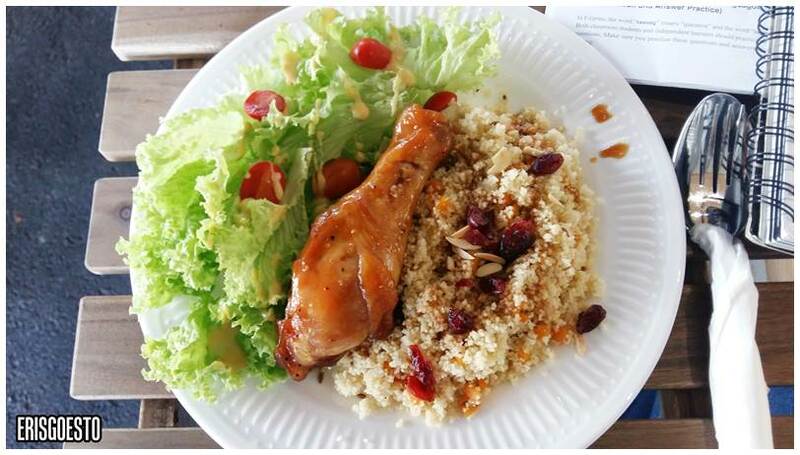 On this particular visit, it was Couscous with Salad and Chicken. The serving was large and colourfully presented. This is gonna sound funny but I have never tried couscous before. I always thought it was some type of rice, but it’s actually steamed semolina. I liked it though – slightly mushy, grainy, with lots of sweet dates cooked in. The lettuce was bitter for some reason but the flavour of the couscous and the tender, nicely marinated chicken masked it so overall it wasn’t a bad meal. The lunch set comes with an iced lemon tea drink for RM14.90. Caught up with H over lunch recently. We went to Fish N Co at The Main Place, USJ. The chain has many branches all over Malaysia; serving up seafood dishes like Fish N Chips, grilled calamari, pastas, pizzas and more. Been some time since I had it, but the quality differs from place to place. The upgraded set also comes with drink and Soup of the Day (below).